For longer stays on the Treasure Coast of Florida select a house, condo or villa from Fort Pierce vacation rentals. Your business trip, vacation or family gathering will seem so much better when you stay in the spacious, comfortable vacation rentals designed especially for visitors to Florida. Choice properties include waterfront along the Indian River Lagoon, inland vacation rentals or island life with a stay at Fort Pierce Beach. Tour the area from a centralized location and enjoy the benefits of a "home-away-from-home" with Fort Pierce vacation rentals. 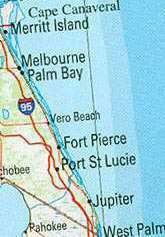 Fort Pierce is just South of Vero Beach and North of Port St. Lucie. One of the oldest established settlements on Florida's East Coast, Fort Pierce is rich in historical treasures. The downtown area has been restored and features a community park and marina, cultural displays and historic Florida buildings - all in a comfortable, walk-around environment. Ecotourism is popular in the area and there are a number of parks and tours to help you enjoy learning about and viewing the local wildlife and landscapes. Fort Pierce is one of the few mainland cities in Florida still having a seaward beach in the city limits and it is only a few minutes across the bridge on Seaway Drive to the public beach. Many more attractions and adventures await the intrepid traveler and they're all available from centrally located houses, condos and villas of Fort Pierce vacation rentals.